Abbreviated key title: Int. j. sustain. hum. secur. The WEInstitute centers its mission and operations on the concept of “sustainable human security”, which provides an academically grounded multi-disciplinary and multi-sectoral integrated framework for adequately addressing complex situations. The concept of human security, from the 1994 Human Development Report (HDR) goes beyond traditional notions of national and military security and includes such issues as development and respect for human rights. It provides an integrated comprehensive framework for designing, developing and evaluating humanitarian affairs and capacity building initiatives in emergency, transitional and development contexts. Today’s globalizing societies are affected by old threats such as international wars and internal conflicts as well as new cross-cutting issues and recurring challenges which undermine both people and their institutions. Human security is a comprehensive concept of interdependent and fundamental freedoms: freedom from fear, freedom from want and freedom to live in dignity. The added notion of sustainability aims at identifying long term solutions for the institutional, economic, social and environmental aspects of human security. Hence ‘sustainable human security’ aims at finding systemic solutions to human trafficking, climate related disasters, recurring famines, chronic poverty, pandemic diseases and extreme inequalities among others. The notion is an essential integrated framework for designing, managing and evaluating programs and initiatives aimed at ensuring the survival, livelihood and dignity of people. Sustainable human security underscores the persistence, interdependence and universality of a set of freedoms which are fundamental to human life. Although some scholars see the concept as either too vague, analytically weak, or limited to situations marked by the threat or outbreak of violence, we believe that a more comprehensive framework is necessary to adequately respond to complex situations. Human trafficking, post-conflict reconstruction, man-made humanitarian emergency, just to mention a few recurring complex problems require an integrated and comprehensive approach which helps agencies to adequately respond from military actions (when necessary) to coordinated humanitarian and development interventions. The concept of human security in general, and sustainable human security in particular, provides the necessary integrated framework for addressing the root causes of conflict and human, economic, environmental and social insecurity. Sustainable human security aims at proposing adequate solutions through sustainable peace-building and human rights based sustainable development. 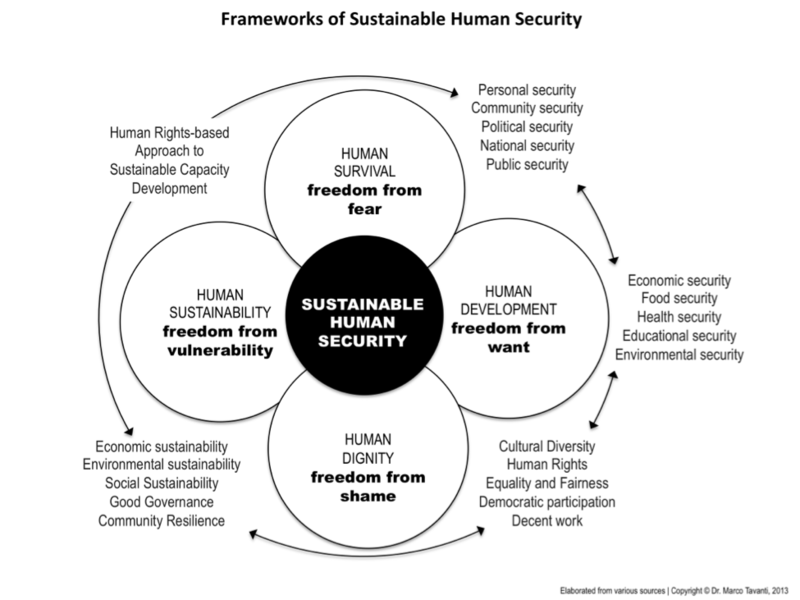 As human security shifts the attention from a state-centered to a people-centered approach to security, sustainable human security aims at considering environmental and systemic elements inherent to the understanding and resolution of contemporary and future human insecurities. Click HERE or on the Sustainable Human Security illustration to learn more about the notion and its studies. The International Journal of Sustainable Human Security (IJSHS) is a peer-reviewed publication of the World Engagement Institute (WEI). The IJSHS provides a forum for sharing practical, analytical knowledge about crosscutting issues on human security. We seek and promote knowledge sharing from a multidisciplinary and expert perspective addressing emerging complex conflict situations, humanitarian emergencies and systemic insecurities. With the editorial assistance of a large network of international, scholar and seasoned practitioners associated with the World Engagement Institute (WEI), the journal offers a forum for sharing applied research around the multifaceted and integrated concept as ‘sustainable human security’. Applied international scholars and human security specialists would recognize the importance of collecting, analyzing and disseminating practical knowledge in the practice of international, sustainable human security. The editorial board of the journal is committed to academic and international standards of excellence through double blind peer-review processes and special editorial planning. The journal seeks contributions that are intellectually stimulating but also relevant to practice. It encourages a multidisciplinary and multi-sectoral approach to complex international issues in relation to human security from a sustainable capacity development and international human rights perspective. Though our online networks the journal provides an internationally dynamic public service space for knowledge dissemination and intellectual sharing for the purpose of stimulating more effective strategies and practices through the critical re-examination of existing approaches to human security. The journal does this by developing new perspectives on the theory and practice of human security as well as new empirical approaches to the study and experiences of sustainable development values applied to the field of human security. The International Journal of Sustainable Human Security is committed to theoretical and ideological diversity in the study of human security to expanding the discourse on human security to include a variety of international, multicultural and multi-sector voices. The editor welcomes ideas for special topics, symposia and reviews from scholars and practitioners of human security. Each issue is editorially organized into special thematic and regional numbers providing useful analytical insights, policy recommendations and effective strategies cases. The Journal aims at providing valuable knowledge sharing for international practitioners and scholars engaged in rule of law development, human rights development, 3-D approach (diplomacy, defense, development), humanitarian emergency management (refugee and IDPs), sustainable development and international human development among other interconnected fields. The focus of the journal is the analysis of the complex interrelations between human security, as a comprehensive integrated framework with sustainability values and paradigms applied to institutional capacity development. The editorial board welcomes contributions from scholars and practitioners involved in areas relevant to human security and those other fields and disciplines traditionally underrepresented in the study of human security. The journal accepts original contributions, illustrative of cutting-edge knowledge in line with the focus areas of sustainable human security. The editorial board screens each article before submitting it to a double blind peer review process. The selection criteria includes the quality, innovation and relevance to the field and literature. Specifically the article should demonstrate (1) solid research supported by proper citation of sources, (2) a cross-disciplinary perspective linking various fields or concerns (3) response to timely issues and/or gaps in the literature and (4) implications for strengthening theory, policy, or practice. Articles should be between 5,000 and 6,000 words (or about 10-15 double-spaced pages). Authors must include a one paragraph abstract and 3 to 5 keywords. Authors should include a bio of about 100 words. The article must include an introduction placing the issue presented in relation to human security the special topic of the issue. The body of the paper should be critical and analytical in nature and well grounded in the existing literature. Illustrations and tables should be included as images in the main text. The conclusions should indicate practical applications and useful recommendations. References must be in footnotes format in accordance with the Chicago Manual of Style http://www.chicagomanualofstyle.org. No more than one footnote reference should be included in the same point of a text. Authors should submit an electronic copy in MS Word format (.doc or .docx) in the IJSHS submission page or in an email attachment addressed to the IJSHS Editor at ijshs@weinstitute.org. Scholars and practitioners with significant experience in the study and practice of a specific theme in relation to sustainable human security could contact Dr. Tavanti for possible editorial collaboration in a special number for the journal. Download the IJSHS Chicago Style Sample of Notes and Bibliography references HERE. Elizabeth A. Wilp, M.S., M.Ed.